Know the types of pass boxes used in pharmaceutical classified areas to transfer the material in different grade areas. Pass box is used to transfer the material from lower cleanliness area to higher cleanliness area or vice-versa in the classified area and also known as the hatch. Pass box works as a barrier between two cleanliness level areas. Pass boxes are used to transfer material for blending, granulation or sterilization in the manufacturing area and sterilization & incubation in the microbiology laboratory. In some cases, equipment parts are also transferred through the pass boxes in sterile manufacturing areas. Pass boxes help to prevent the air flow from one area to another while transferring the material. One door of the pass box opens at a time and both the doors cannot be opened simultaneously. There should be an interlocking system in the pass boxes. A) Dynamic Pass box: Dynamic pass box works like an airlock or Laminar Air Flow unit. 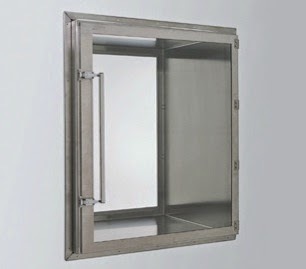 Clean air enters in the pass box and prevents the entrance of the contamination. Dynamic pass boxes may be Cascade, Sink or Bubble type similar to the airlocks in pharmaceuticals. B) Static Pass box: Static pass boxes are simple boxes mounted between two areas and also known as passive pass boxes. The area having higher cleanliness level shall have the higher pressure that helps to prevent the entrance of contamination in the sterile area. Ultra-violet light is also installed in the pass boxes to remove the contamination that may enter during the transfer of material. It should be replaced after 1000 burning hours. Pass boxes should be cleaned with disinfectants at regular intervals. The efficiency of the pass boxes should be verified by validation. Validation may be done by exposing the known population of the bacterial culture. Is it mandatory to do particle count test on all corners of the pass box like top corners for grade a pass box?